I’ve made some changes to my backpacking gear this year. Old, heavy items have been replaced by lighter alternatives, and I’ve stopped carrying quite a few things that I never really used or needed. The overall result is a significantly lighter load that makes mountain travel far more pleasant. The biggest change has been a complete shift to lightweight trail shoes. I’m planning some big trips for later in the year, so decided that a short backpacking route to test out some of my new items of equipment—and to gauge the effectiveness of the overall package—was necessary to avoid pitfalls later on. 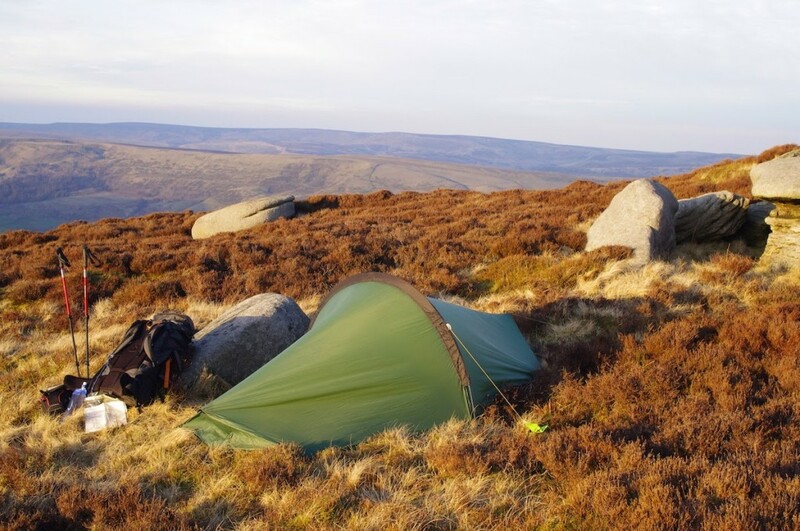 I selected a circular route in the Peak District, with a goal of circumnavigating Kinder Scout via the northern edge. It’s about twenty-four miles in length. I walked it anti-clockwise to have the Great Ridge to look forward to at the end. I caught the train up from Lincolnshire and arrived in Hope just before three o’clock in the afternoon. The weather was glorious for early April. I trod grassy paths to the summit of Win Hill, delighting in the sensation of air across my toes. My new shoes are fantastically comfortable and I was already getting the sense that this change to my gear alone would make a huge difference to my comfort on the trail. I walked only about six miles that afternoon. When the light began to fail, I took a little time selecting the right campsite. There’s lots of flat ground on Blackden Edge, but most of it is tussocky or heathery. Eventually I found a comfortable patch of grass beside a boulder. My campsite for the night. Not exactly flat, but comfortable. I awoke at six to a sunrise just as beautiful as the sunset had been. The first tendrils of light crept over the slopes of Kinder, and as I ate my breakfast and contemplated the map, I couldn’t help but feel excited about the trail ahead. 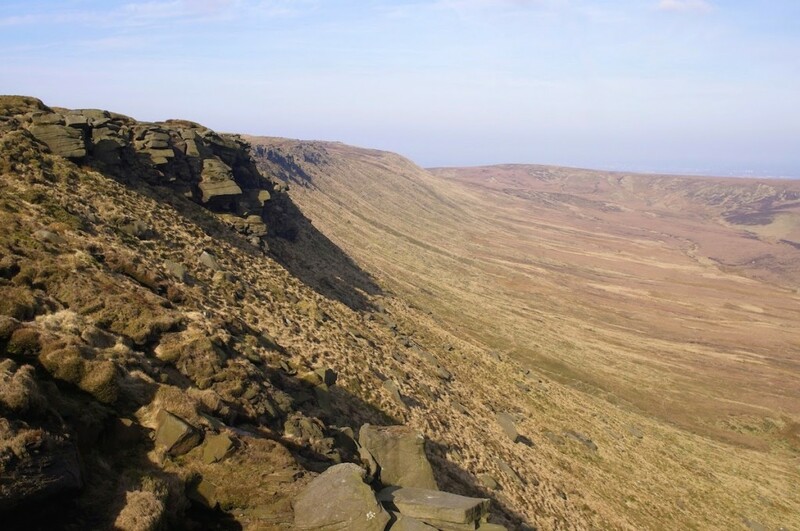 As I strolled along the northern edge of Kinder, I was again struck by how dry the plateau was. Most of the streambeds were empty. The paths were, by and large, dry and firm underfoot. 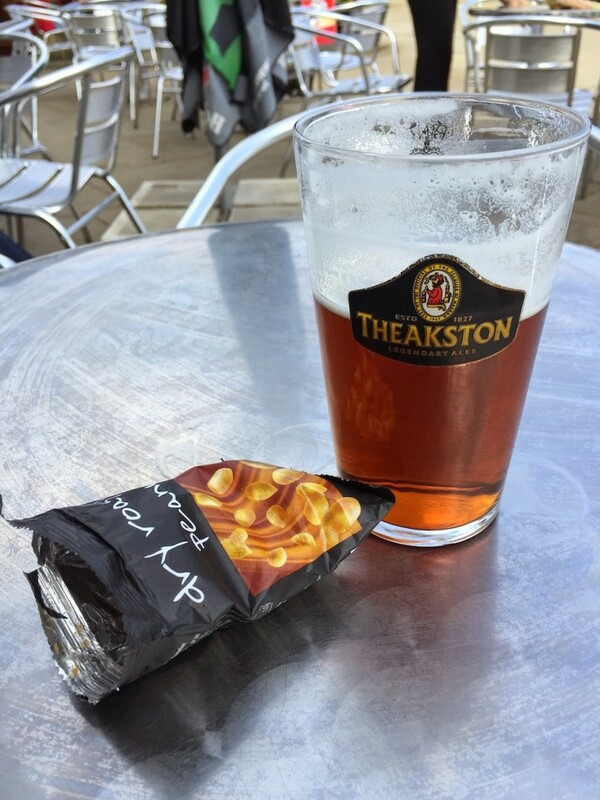 On my last visit to Kinder in 2008, the entire mountain had been a great big quagmire and I remember being plastered up to my knees in mud when I stumbled into the Old Nag’s Head. This time I was wearing trail shoes and hadn’t even got my feet wet! 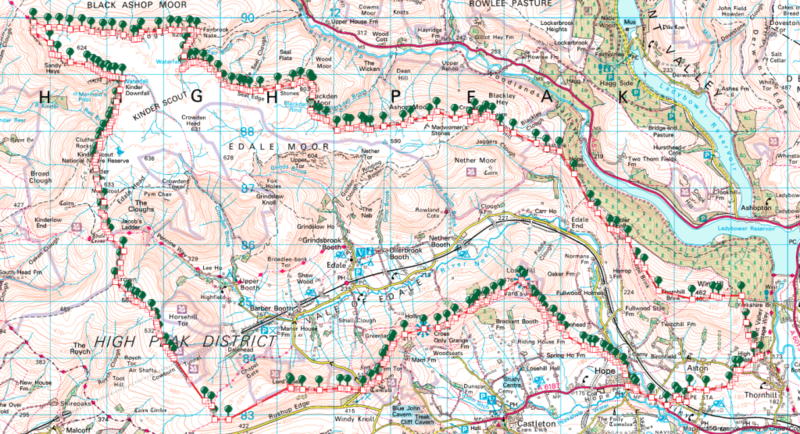 At the far northwestern edge of Kinder there is a sharp prow of land where the northern trail intersects the Pennine Way. 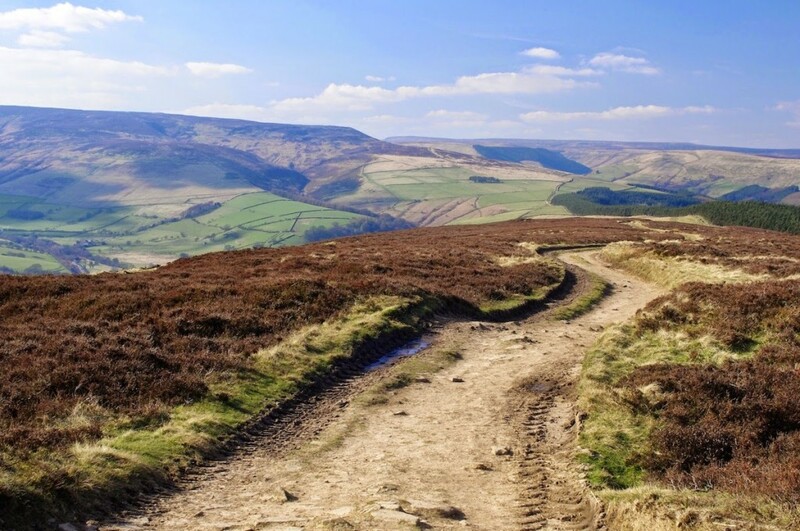 Suddenly the character of the landscape was different; the track was rockier, more eroded, and for the first time I met other people—mainly coming the other way, from Edale. Some were runners while others laboured under monstrous packs, and I was asked on several occasions to point out an uncertain walker’s location on the map. Conservation efforts are underway on this side of Kinder. Much of the peat has become severely eroded, and the National Trust is coordinating efforts with other bodies to protect the remaining habitat and plant new vegetation. I noticed areas of peat recently re-planted with grass, and it seems that life is tenaciously clawing back its hold in this desolate landscape. After descending south from Kinder Low and crossing the top of Jacob’s Ladder, I continued along the wilder landscape of Brown Knoll and Horsehill Tor. These hills are broad and almost completely featureless, and far, far boggier than Kinder itself. Until then I had managed to keep my feet dry, but within ten minutes of walking across the bog of Brown Knoll I had given up on trying to keep the water out. I lost time as I picked my way across the vast stretch of peat. My train home was at twenty to five, and for the first time on my journey I began to consciously increase my pace, well aware that I had many miles yet to walk. Horsehill Tor is a little slice of wildness. 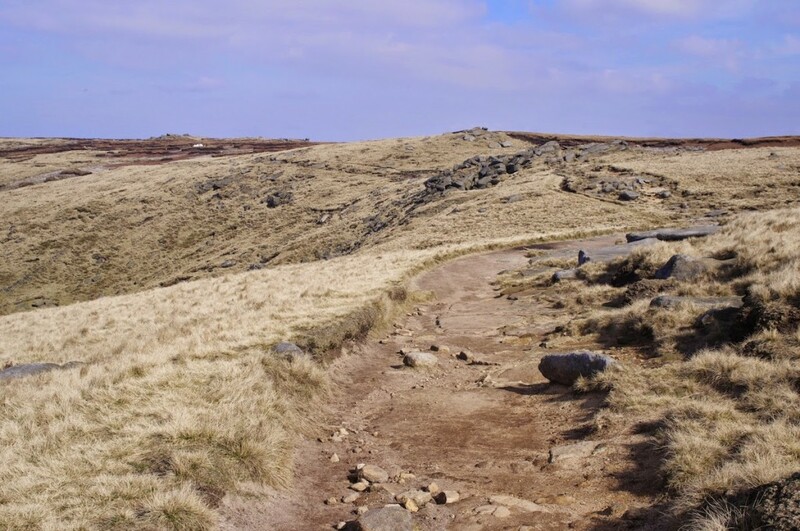 I had felt alone on the northern edge of Kinder, but the bustling Pennine Way had reminded me that Kinder is very much a playground for hillwalkers, runners and cyclists. 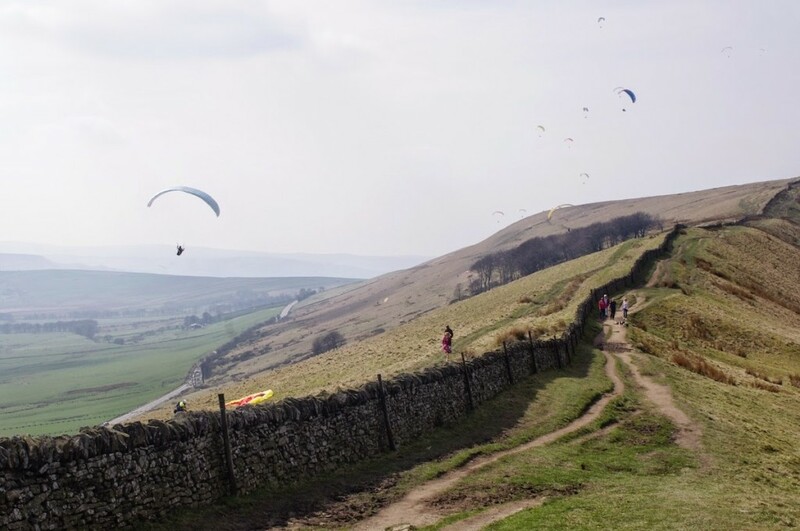 Likewise, the Great Ridge of Edale stretching over Mam Tor is extremely popular. But the paths are sketchy on Horsehill Tor and I didn’t see another soul as I marched through the bog. I hardly paused at Lord’s Seat despite the spectacle of paragliders swooping through the air nearby. Ahead I could see Mam Tor, the last major high point of the day, and even from this distance the crowd on the summit was clearly visible. In fact, I hadn’t been alone since joining the track up Rushup Edge. Many other walkers were enjoying the fine weather. The Great Ridge of Edale. Fine walking! 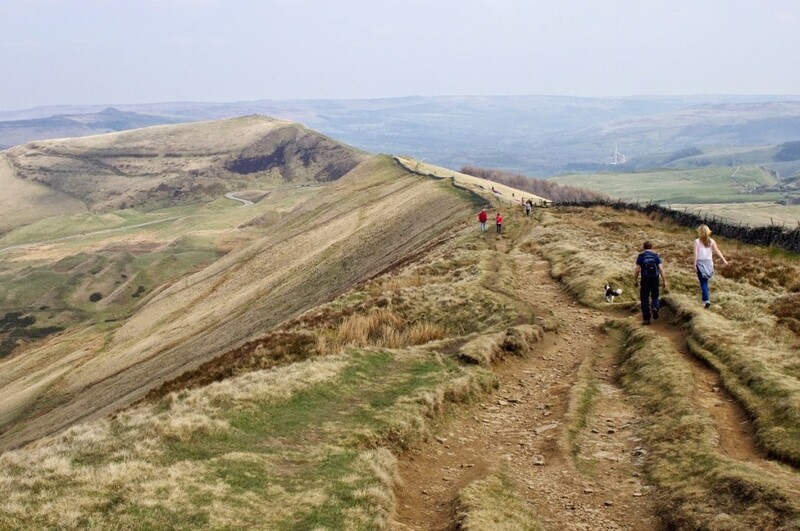 Mam Tor is a fine mountain in miniature and the summit makes a particularly splendid viewpoint for the surrounding countryside. I’d climbed it almost a year ago when I made the ascent from Edale with Hannah, my brother James, and his partner Nicole. 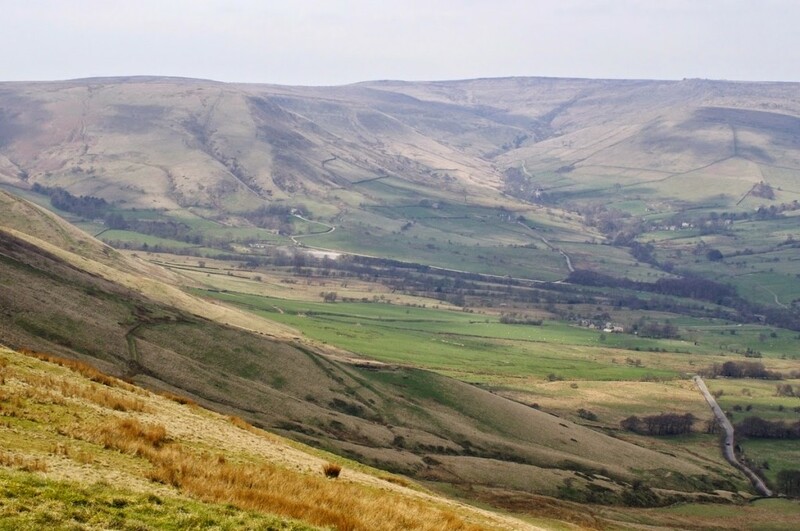 On that day we’d chilled for a while on the grassy slopes near the summit and squinted down at the patchwork of fields in the valley below, or maybe looked across at the uniform bulk of Kinder and tried to see walkers picking their way, ant-like, across the Edale skyline path. But on this occasion the clock was against me. 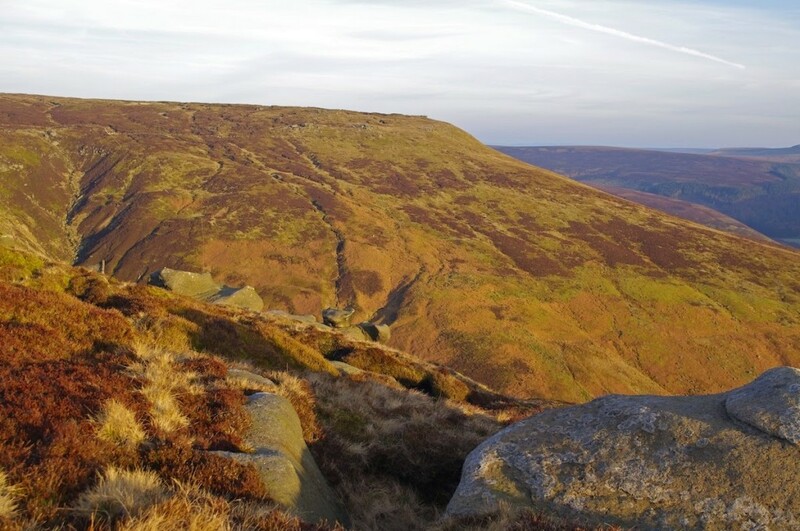 I took five seconds to gulp down a mouthful of water and began to jog down the ridge towards Back Tor. I’d made up the time I’d lost crossing the bog and had caught my second wind. There’s something uniquely exhilarating about striding along a ridge at a good pace, particularly when you’re on the home stretch and can imagine that pint waiting for you at the end of it. 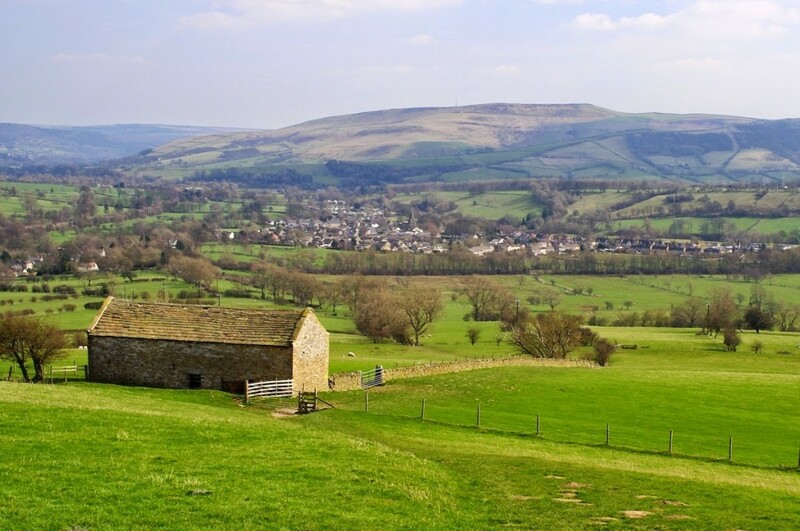 I hardly noticed Back Tor and Lose Hill pass under my feet, and before I knew it I was yomping down the grassy slopes and crossing stile after stile with Hope and journey’s end in my sights. I paused for breath at the Old Hall Hotel in Hope. I thought I’d be pushing my timetable, but to my surprise I found I still had an hour to go—and that hour was put to good use savouring a pint of Old Peculier. 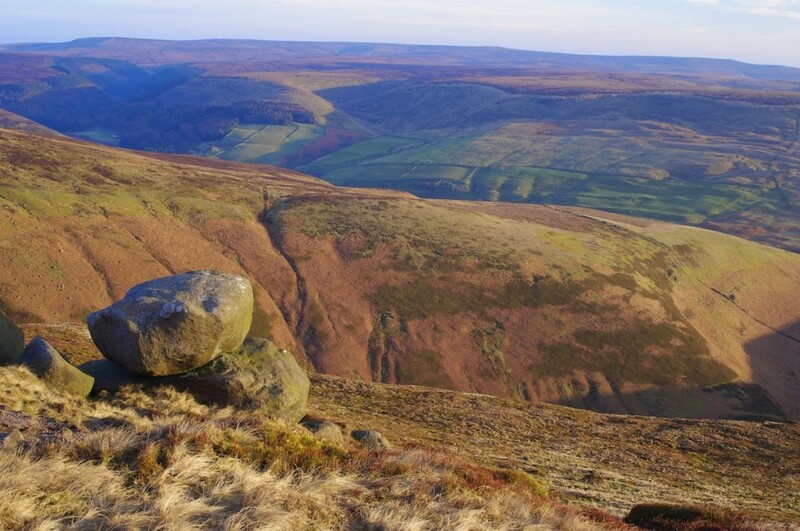 So it turns out that the tour of Kinder Scout makes a splendid walk. 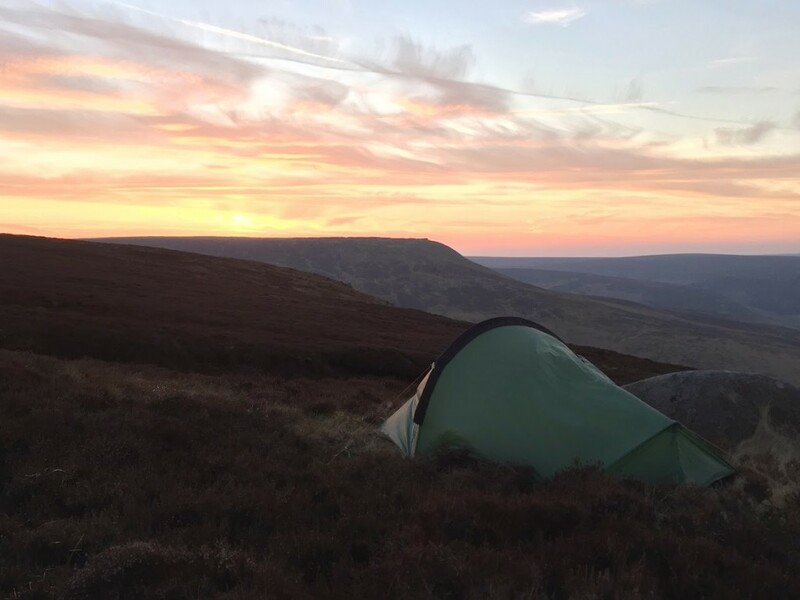 I took a day and a half and a wild camp to complete the circuit, but there’s no reason why a strong and fit walker shouldn’t be able to do it in a day. For me, however, part of the pleasure of a route like this is in enjoying that night spent on the mountain—being up there when the sun sets and rises again, selecting a safe haven for the night, and attuning myself to the rhythms and ways of the hill. Go up there just for the day and I’d feel like I was missing out. What about my other goal, to test my new, lighter kit? I’m glad to say that was a success, although I did learn that sometimes you can’t rely on taking water from streams that might be running low or empty. I can’t believe I didn’t fully commit to trail shoes years ago, and at no point did I stop myself and think, ‘I really wish I’d packed that bivvy bag and extra spare clothes I used to take just in case.’ This trip has given me confidence in the equipment I’ll be relying on for longer and more serious trips later in the year. Light is right, but ultimately the gear you carry (and the gear you leave at home) is just a means to an end. Watching the sunset from the hill, or that feeling of freedom as you stride along a ridge in the sunshine, is what it’s all about. By request, here’s the gear I took on this trip. I haven’t weighed the items individually but base pack weight is now under 10kg. If I left the DSLR at home I could get it to less than 9kg, but a good camera is a necessity for me. 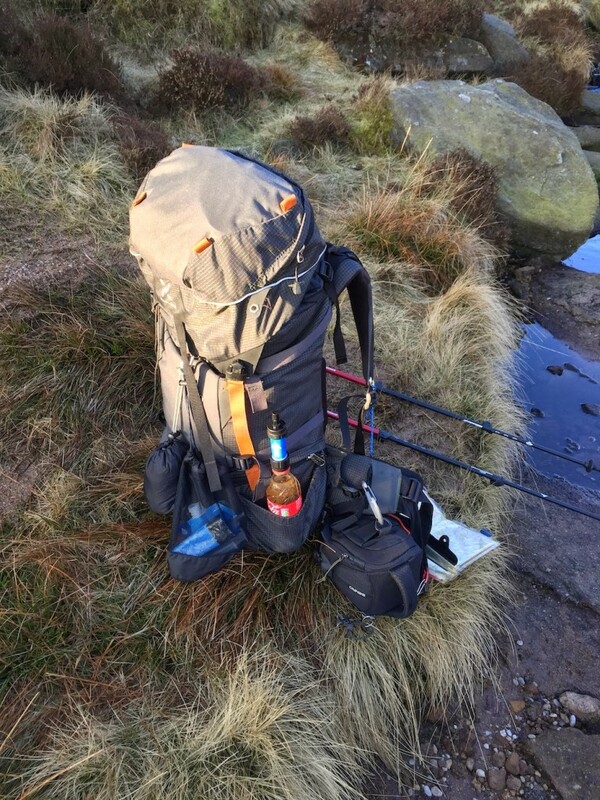 Please note that this is the gear load I intend to take on the Cape Wrath Trail, so I specifically wanted to use the exact same setup for this trip; I didn’t actually use any of the spare clothes, repair kit, or most of the wash kit.